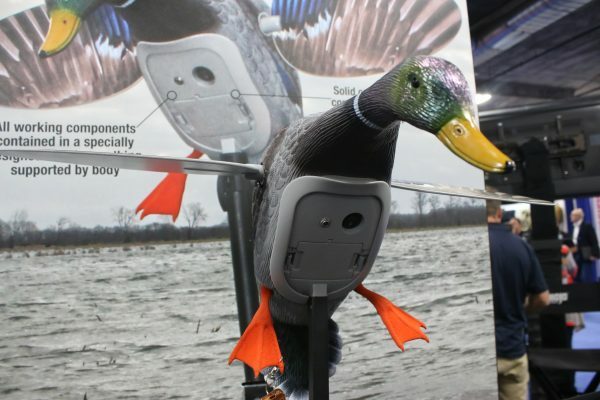 Hunting has come a long way so it’s no surprise that decoys have too. We spoke with the founder of Mojo Outdoors and the star of Mojo TV Terry Denmon about the company’s latest duck and turkey decoys. The company recently unveiled at SHOT Show 2017 in Las Vegas its new Mojo King Mallard, said to be its best version yet, and a new Mojo Tail Chaser, which attaches an artificial turkey fan to the barrel of a shotgun. Based in Louisiana, Mojo Outdoors has been a leader in hunting decoys for almost three decades. With the latest Mojo King Mallard it puts all the working components in a specially designed housing so that it’s not supported by the body. It’s also quieter and more flexible for a more life-like appearance. With the Mojo Tail Chaser, the hunter can creep up on a turkey behind a fan of tail feathers and not need to expose himself to fire a shot. In this way, the feathers can continue shielding the hunter up until the shot actually fires. “We feel we’ve revolutionized turkey hunting,” Denmon said.